Maybe this has happened to you. You have a goal, a plan, and a list of all the things you need to do. You feel determined as you begin checking off tasks from your list. But then you get a text message from a friend, a work-related email, a Facebook notification, a new follower on Instagram. One click leads to another, and before you know it, you lose track of time. The next day you tell yourself, “Today will be different. I will be focused.” Yet, for some strange reason, the cycle continues, and you find yourself repeating the same mistakes over and over again. This happened to me as well. When I started this blog, I juggled ten or more tasks at the same time. I jumped back and forth between replying to emails, searching for new information, thinking about promotion strategies and in the midst of it all had to find some time to write. At the end of the day, I would end up with a dozen of half-finished tasks, not a single one of them done the right way. That was until I refocused and applied the following tips. Consider what importance does this task have to your overall goals in life. Sometimes you have tasks on your list just because you put it there automatically, without giving it a second thought. It’s just something you have to do. This unconscious approach results in long, disorganized lists that never really get done. So just a few seconds of inner reflection can give you the clarity and simplicity that you need. Now apply the question to all items on your list. How do they measure in relation to your current top priority in life? Do they play a key role? Can these pieces fit together and help you move forward? You should be able to see clearly which do and which don’t. Put irrelevant tasks aside. They’re not entirely useless, but can confuse and lead you astray at some point. You should end up with 3-5 most important tasks for the day that you need to do. Write them down and put them somewhere visible. So visible that your gaze easily finds them wherever you look. Stick a sheet of paper on your wall, put a sticky note on your computer screen. It will serve as constant reminder of your top priorities for the day. Complexity can slow you down even when you have only 3 tasks on your list. If you feel stuck, break each task into basic components so that you’re taking one small step at a time. This simple change will ground you in the present moment, and you will stop thinking about the outcome. Each tiny leap forward will be light and natural. You may also have smaller tasks that need attention in some way or another. In that case, batch them between your most important tasks and turn them into mini-breaks between the bigger tasks. How often do you get distracted by checking email, Facebook, Twitter, Instagram? Pause for a moment and catch yourself switching between the tabs in your browser, clicking links, reading new posts, and getting involved in discussions. So many exciting things are happening at the same time, and it’s so easy to get lost in the noise. Am I saying that you have to give it all up? You know without a doubt what you need to do, but automatic habits make you click anyway. Here is a simple solution: design your environment in a way that will reduce your distractions to a minimum. By doing this, you can catch yourself in the middle of being distracted, stop, and re-focus. So put away your phone, close browser tabs and apps that you don’t use, clear your desk. Now you have some breathing room for productive work. Sometimes it can be hard to do it all on your own. Your willpower might fail you at any moment, and the threshold is minimal. You can boost your motivation at any time by publicly announcing your intention to complete a task or achieve a goal. Tell your partner or your friends what you set out to do. Before you begin, put your social media to good use by making it public that you’re going to finish these 3 tasks today. Tweet it to your followers, post it on Facebook and Instagram. You’ll be quite surprised how much motivation that will give you to stay on track. Have you ever noticed an urge to switch tasks right in the middle of the process? It’s almost like some gravitational force is pulling you in the opposite direction. Something else feels more critical and demands your attention. At that moment you are split into two halves: your body is performing the task, but the mind is elsewhere. Instead of fighting it, acknowledge this feeling. Stay with it. Become highly alert and continue with your current task. Don’t try to predict the outcome of your actions, let them flow unconditionally. Forget about everything else and let the task become you. Just as it’s important to finish the task, it’s equally important to pat yourself on the back for the job well done. But don’t feel rushed to the next thing. Pause to reflect and acknowledge what you’ve just done. Let the feeling of accomplishment flow through your body. Let it sink in and energize you from within. You spend your days controlled by your schedule. Unending tasks, projects, work meetings, personal arrangements, deadlines. It’s time to stop being controlled by outer circumstances and take a conscious pause. By stepping back and looking deep within you’ll realize what you need to do. You will feel calm and in control. Every action you take will flow naturally from your inner state of presence and clear perspective. 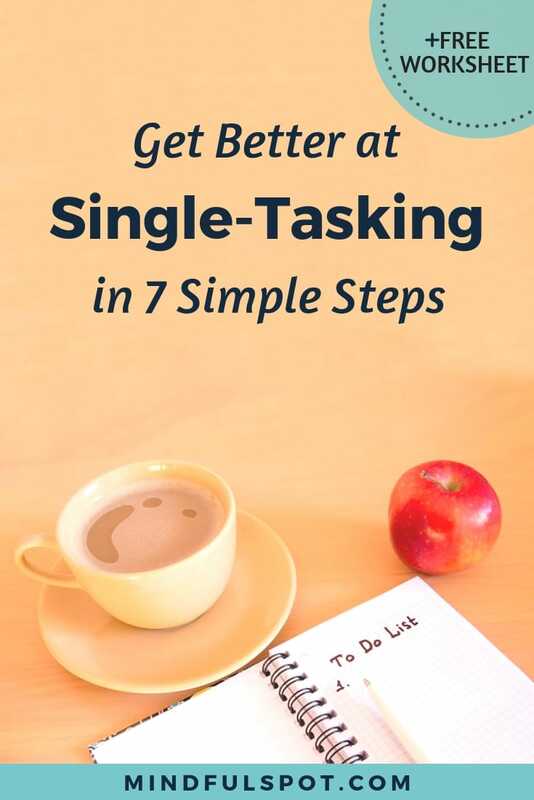 Look at the tips above and start implementing them to get better at single-tasking today. To help, I created these worksheets that you can download via the button below. Hey there! I’m Gavril, founder of Mindful Spot. start a meditation practice, and use it to improve every aspect of your life. Sign up for my newsletter and get a Free Meditation Worksheet.